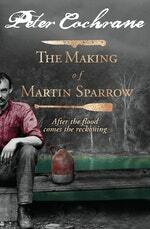 Exploring themes of hope and renewal, survival and redemption, The Making of Martin Sparrow is an action-packed reimagining of life on a brutal frontier with all its inherent misogyny, race hatred and violence brought alive with Cochrane’s mastery of the colonial vernacular and his eye for comedic detail. Perfect for your next book club catch-up. As the title of the novel alludes to, we're witness to the making of Martin Sparrow. Is there a particular moment you can point to that changes him, or is it a gradual change? What's the significance of that change? Is it truly transformative – is it enough? The past looms large in the lives of many characters, including Sparrow, Cuff, Bea and Mackie. Do they manage to escape or defy their history, or are they still held captive by it? Mackie considers himself an upstanding servant of the governor, but Cuff delights in pointing out his selfish motivations and the ways he's compromised. What, ultimately, do we make of Mackie's morals and the decisions he reaches? As he explains in the afterword, Peter Cochrane has drawn a number of elements from history, including capital punishment, the sale of wives and the dispossession of Indigenous Australians. How might we judge the real people who carried out these acts, which we now consider abhorrent, and did the portrayals of the fictional characters in Martin Sparrow change your view? Much of the novel circles around the conflict between those seeking to maintain order and those undermining it. By the end of the story, which side is in the ascendancy? Sparrow is indecisive and feels defeated, and people continually take advantage of him. Do we blame Sparrow for this? Is he lazy and naive? Or is he overwhelmed by circumstances, and undone by the cunning and malice of others? Peter Cochrane has built a rich language to describe this world, often rendering it beautiful, or hilarious, but also true to the shocking violence of this time and place. How do the different characters cope with the brutal world they must inhabit? How do those party to the violence justify it? Bea has many admirers, although each sees something different in her. What similarities and differences are there in their desire for her? Do any distinguish themselves? In what ways is her agency withheld, and by whom? The geography of the Hawkesbury is almost a character unto itself. As Cochrane reminds us in his afterword, it was likely a 'wilderness' only to the white settlers. In many ways the settlement and farms are far more chaotic than the world surrounding them, although the fastness is not without its perils. Why is the thought of a settlement beyond the mountains so appealing to the bolters? What relationship does each of the characters have with the setting, and what does that tell us about them? A number of different parties travel up and down the river and the Branch, for different reasons. What do the similarities and echoes within these journeys reveal about the landscape? Dr Woody and Catley are both men of science, but in very different ways – one serious and domestic, the other ridiculous but out in the world. Similarly the constables Mackie, Cuff and Sprodd all have very different outlooks and demeanours. Are any of these characters better adapted to their pursuits than others? How do their ideas of a vocation compare to those we might hold today? A recurring theme of the novel is hope. Sparrow in particular is a dreamer – he longs for companionship and a peaceful, untroubled life. What hopes do each of the characters cling to, and are they realistic? Do any of them relinquish hope? How near or far are they from realising their aspirations at the close of the novel?